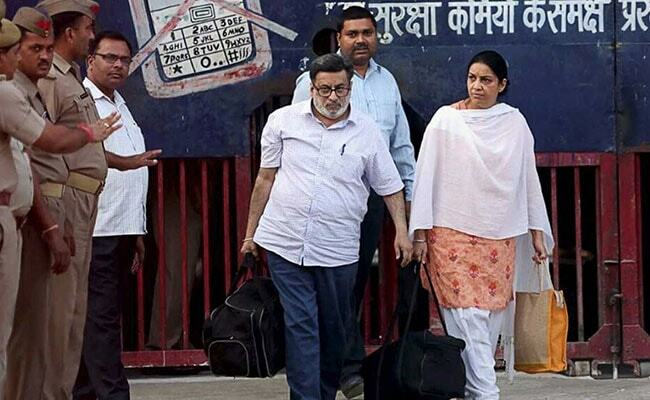 Rajesh Talwar's brother said the dentist couple, who walked out of Dasna Jail in Ghaziabad today after four years behind bars, were in no position to speak to the media. New Delhi: Nupur and Rajesh Talwar will never get over the pain of losing their child, but will try and get back to a normal life, Rajesh Talwar's brother Dinesh Talwar said today. "The pain of losing Aarushi can never go away and the grief over her loss, which was somewhere bottled up, will now come to the fore. They are not in a position to talk," he told reporters here. The police escorted the Talwars to Aarushi's maternal grandparents' house in Noida's Jalvayu Vihar. The Talwars lived in another flat- where the double murder took place in 2008- in the same housing complex. While addressing the media in Noida, Dinesh Talwar hinted at media reports that linked Aarushi with Hemraj, and said they were not "guilty". "Aarushi and Hemraj's names were linked in this story. It was not only her parents who had been branded guilty but it was also Aarushi who was meted out the same treatment. Even Hemraj was held guilty. At this point, we can say none of them was guilty," he said. In the last four years, the family had controlled their emotions because they had to fight the battle in the "quest for truth", he said. "We forgot everything else and our motive was to clear Aarushi's name. The day Rajesh was convicted, he told me, 'I will fight this battle for Aarushi till my last breath'. He did not say that he wanted to come out of jail. He wanted to clear his daughter's name," Dinesh Talwar said. He also requested the media to respect the couple's privacy and allow them to get back to a life of normalcy. Since the Talwars walked out of jail at 4.45 pm today, the media has been dogging them. "They are not in a position where we can say that they are normal. They are not even in a condition to soak in the fact that they are now home. It will take some time for them to register this," he said, adding that it had been "emotionally draining" for them. He said he would do everything to support his brother and sister-in-law, while adding that the pain of losing Aarushi would never go. "Please give them some time to get back to a normal life," he said.